Point of a Million Connections: The Family Meal: Easier than Ever! Kids more likely to stay away from cigarettes and alcohol. They're less likely to use illicit drugs. You'll be more likely to hear about a serious problem. Kids will feel like you're proud of them. I like to cook, and I come from a family who always sat down to eat dinner together. I am doing the same with my children. Works for us. However. There seems to be an unstated assumption that you could be running a crack house but if you started sitting down to dinner with your kids - even take-out pizza, as one site suggests -your life would turn around. I don't know about you, but it seems a little suspect that the one commonality amongst high-performing families in these studies is that they sit down to dinner together. But let's suspend our disbelief, and ignore the probability that families that have the time and resources (knowledge, tools, money) to prepare meals and eat them together probably also have the time and resources to help the children with homework. How cool is that? Fractal vegetables. As the blogger from Love Apple Farm says, "You could steam this baby whole, present it to your perpetually bored lachanophobic teenager, and with any luck, get him to eat his veggies AND start a conversation about molecular nanotechnology." Let me know how this magic bullet works for you! I'd especially appreciate if you could introduce this to some malnourished poor families, preferably with a tone of condescension, and report back on the results! Love those quick fixes - reminds me of fast food. On a related note, that beautiful photo almost (but not quite) made me wish I liked broccoli. Well, I do like it to look at, just not to eat. I get very excited about Romanesco. 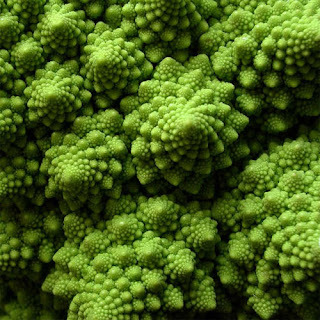 I've gotten weird looks from strangers right in the grocery store when showing my kids the fractal veggies. Thankfully it's yummy! Did you find anything about the effects of reading while eating with your family?